Y’all, I’m not kidding with the title up there. If you love German Potato Salad as much as I do, the first bite of this will bring tears of joy to your eyes. This really is The BEST German Potato Salad! I found the recipe in one of my grandmama’s old cookbooks that I inherited after she started taking her suppers at the big kids table with Jesus and tweaked a little bit to come up with German Potato salad heaven. And even the naysayers were impressed! 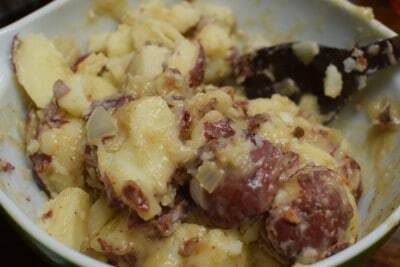 My husband hates German potato salad but guess what he had for supper the night I made this? Yup. German Potato Salad. He took one bite and told me there wasn’t any sense in bothering to make anything else because he was just gonna eat this. The secret is all in the dressing. It’s absolutely infused with flavor because the base is bacon. Did you know that bacon drippings are the most flavorful grease there is? Seriously. 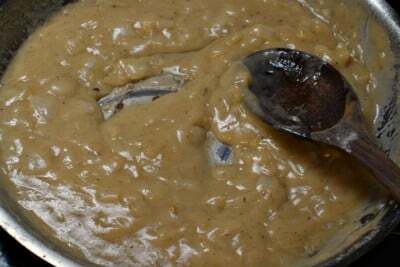 Well, you take those bacon drippings and then you sauté some onions in it, then you add a little bit of this and that, flour to thicken it, some vinegar to splash it up a bit, and you basically end up with a bacon gravy, but we’re calling it dressing in this post. But there is another secret, too, and that is the timing of when to pour the bacon gravy over it. See, when your potatoes are warm, they are absorbent. If you wait until they cool to pour your dressing over, they have formed a starchy film over them and they won’t soak it up, so it will just coat the outside. If you pour it while they are still warm, though, they’ll actually absorb part of the dressing and become infused with the flavor. I knew you wanted to know all of that, right? Right. Okay, so lets make us some German Potato Salad. Get a hanky ready, it’s that good. You’re gonna need some red potatoes, bacon, sugar, flour, onion, salt, pepper, and apple cider vinegar. Note: We use Turkey Bacon now and it’s still just as delicious. I’ve been going through Bragg’s vinegar like it’s water around my house and it has made a huge difference in cutting out cravings for snacks in between meals. Check out my VinTea recipe here for a delicious way to add vinegar to your day by clicking here. You see all of that flour there? that is what thickens your dressing and basically makes it into a bacon gravy that your warm little potatoes just drink up! Just wash your potatoes and then put them all in a pot, covered with water, and bring them to a boil over medium high heat. You’re going to want to boil these until they are fork tender. I boil mine for about twenty minutes or so. Did you catch the whole “wash your potatoes” thing in there? Why would you need to wash relatively clean potatoes if you are just going to essentially sterilize them in boiling water for nearly half an hour? This would have been important if we had just dug these puppies up, sure, but the ones you buy in the grocers or at the farmers market have already had the dirt knocked off of them. Honestly, in most recipes like this, you won’t find me washing potatoes. I just throw them in the pot. This is one of those instructions I added because some people need to see it. I get that. I’m okay with that. Keep on washin’ them taters and rock on! That is one of my favorite instructions to read or write in a recipe. Most folks have a specific brand or type of bacon that they prefer. We really enjoy uncured Turkey Bacon. 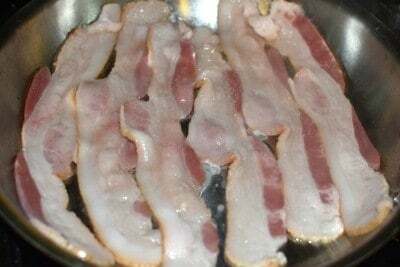 After you get this bacon cooked, remove it to a paper towel lined plate but don’t do anything with all of that lovely grease in your skillet. If you don’t have a lot of grease due to using turkey bacon, add a tablespoon or so of vegetable oil. After you remove your bacon, add your chopped onion to that skillet and cook it over medium heat, stirring often, until your little onion bits are all translucent and golden like this. Now close your eyes and spell “Translucent”. Take this off the stove eye and set it aside for a minute. Drain your potatoes and then pour them into a large bowl to let them cool for just a few minutes so they can be handled without feeling like you’re holding hot coals. Oh wow, look! It suddenly turned into dressing! 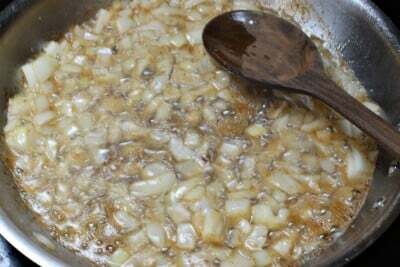 Once your onions are lightly browned, remove skillet from heat. Stir in water, vinegar, sugar, and flour. Salt and pepper to taste (I start with 1 tsp salt, 1 tsp pepper). Return to heat and bring just to a boil (over medium heat) while stirring constantly. Once it comes to a boil, boil for one minute, while still stirring. “Gee, Christy, you just ain’t letting up on this stirring thing.” I know. Now hush and do it, I’m hungry. and BOOM! You have what is pictured above. Now I want you to act fast. Remove dressing from stove eye. Carefully slice your potatoes and place them in a bowl. They will break up a little bit and that is okay, just do the best you can to carefully slice them and make an attempt at keeping them intact and their skin on. Crumble all your bacon and put on top of the potatoes. You should probably eat a few bites just to keep your strength up. Now, pour all of that warm thick dressing over them. And listen, the dressing is thick because it was thickened with flour, not because it was made with bacon drippings. It is delicious because it was made with bacon drippings. I just wanna clarify that for folks new to German Potato salad nirvana. Stir carefully and well to coat all of your slices. This is the key and doing it while the potatoes are warm makes a world of difference in the flavor of your potato salad. Eat the potato salad. Eat all the potato salad. 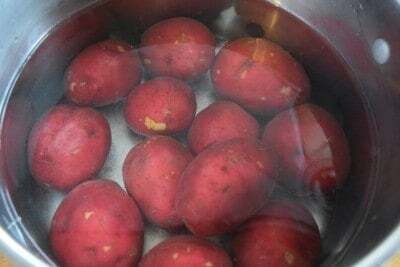 Boil the potatoes whole, without peeling, until fork tender. Drain and allow to cool until you can handle them. Slice as thin as you can into a large bowl. Set aside. In large skillet, fry bacon until crisp. Remove to paper towel lined plate and reserve bacon grease in skillet. Crumble bacon on top of potatoes in bowl. Saute onions in bacon grease over medium heat until tender. Remove skillet from heat. Stir in water, vinegar, sugar, and flour. Salt and pepper to taste (I start with 1 tsp salt, 1 tsp pepper). Return to heat and bring just to a boil while stirring constantly. Boil for one minute, while still stirring. Remove from heat and pour over potatoes. Carefully stir until well coated. Serve warm. ~Unknown. Submitted by Linda A. Click here to submit your favorite quotes! Carrot Cake Recipe from Southern Cakes! Yum. I know what I’m making next time we have burgers for supper. I bet this would be amazing with a good homemade hamburger and some spicy baked beans. Hi Christy, there must be as many german potato recipes as there are southern barbeque recipes. Both my parents came from Germany and the only way we had potato salad was made with cooked potatoes, tossed with chopped onions and a little oil and a dressing made with vinegar or lemon juice amd salt and pepper. It was always served at room temperature. In the summer cucumbers were added and in the winter often chopped pickled herring. I guess you had to grow up with that one. Really like your posts and have a Happy Easter. Oh what I would give to sit at the table during one of your family meals! I’d even try pickled herring 😉 Happy Easter to you, too! Try arrowroot would only need 2tsp. SO glad someone finally brought up my favorite potato salad! There’s a lot of German heritage in our family tree- we’ve been making this stuff for generations. Double the bacon, and double the dressing. And never, ever make just one recipe of this stuff- you’ll wish you’d made more! I always make a double (so a quadruple of the bacon and dressing). I usually bake my bacon a pound at a time in the oven in a 13 x 18 cake pan because I’m usually making this for a family gathering or pot luck event. Any extra bacon can be refrigerated or even frozen for adding to another recipe or rounding out some eggs or pancakes for breakfast. That’s IF you have any “extra” bacon left over. Christy: your German Potato Salad sounds very nice. I can’t have potatoes, so I make mine with pasta. If you add 1/2 cup of vinegar to your water when you cook the potatoes, it will not only flavor them, but it will slow down the breakdown of the pectin in the potatoes so you will have a firmer, and not mushy slice of potato. You can take 1 cucumber, peel, cut in half lengthwise, deseed and slice it in 1/4″ slices and marinate it in 2 T. sugar, 1/2 cup vinegar, 1/2 t. dried dill and 1/2 t. salt for half an hour. Drain, and add to your potato salad with the dressing and bacon. I was skeptical about adding cucumbers, but they are fantastic and I don’t make my salad without them now. My stomach considers dill weed to be totally poisonous so instead of using that, I add 2T of dill pickle juice. Dill seed does not set off the same red alert in my stomach, and I get the nice taste of dill. Will probably make this recipe tonight since I have all the ingredients on hand. Actually, we just bought Wright’s bacon the other day at Publix where it was $2 off, plus we had a $1 coupon! I cooked some for breakfast this morning (it was very good) and as I poured the grease into my grease can I told my husband this was my pot of gold. I had previously used all my bacon drippings and I know what you mean by using it for seasoning. At our local Wal Mart the other day, right after your tea recipe was posted, the shelf with that brand of vinegar was empty. You must have a big following here. 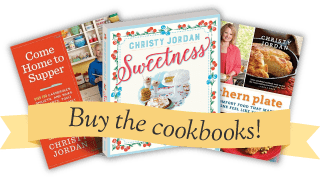 I’ve enjoy your recipes almost from the beginning of your posts and I do have all of your cookbooks and have given copies to my daughter and granddaughters. I have never been a fan of German potato salad. But this recipe is a must try for me. One of my daughters is visiting next week and wants to go saltwater fishing off St Georges. We will catch some redfish or buy some smoked mullet. ha ha Either way, this will be a perfect time to give it a try. No need for luck this time, I always catch fish. Ya right Balti, find out where they sell real good smoked mullet, ha-ha! Have a good week end, Helga. Christy, pickled herring in potato salad is delish, and love hot potato salad we left off the German since it was just a family salad. The recipe was one I wrote in my notebook when we moved from home. Will print your recipe off, and make it for Sunday. Bacon and bacon grease are staples in my life, makes great biscuits, and not too bad pie crust especially for Tortiere at Xmas. Oh yeah, I can’t forget the sliced maters and onions on the plate too! OH! And banana puddin for dessert. Except for my sister Ann. She said stove eye. I asked her one day why, and she said her Mother in Law said it that way, and she just adopted it. Her Mother in Law was from… you guessed it, Alabama! As always, a great recipe from you and good memories, whether they are yours or mine. Ladies, I am in dire need of your recipe for potato salad with pickled herring. When I saw it on the net I nearly fainted, this was my Mommas New years salad, and I am dying for that taste but my Omi passed many years ago and my Momma followed her last year. Now here I am, I remember the taste, but not how it was made. I would be ever so grateful if you could send it to me via e-mail, or direct me to a cookbook that is publishing this. I haven’t ever made it using Yukon gold potatoes Barbara. They tend to be a softer potato so they may fall apart on you quicker. Other than that, it should work just fine. 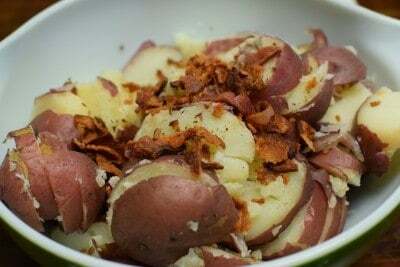 My recipe is very similar to this one, and I have used russet potatoes when I couldn’t find red potatoes. I make the gravy and let it simmer while I peel and slice the potatoes. I like to use equal parts vinegar and sugar, and I like chopped green onions (raw) mixed in with the potatoes instead of the sauteed onions. I agree that pouring the sauce over warm/hot potatoes makes it very tasty. I always make this to go with schnitzel, but it’s great with burgers and brats with a side of baked beans. I also serve this with ham. 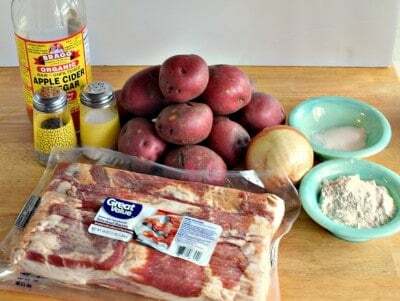 Bacon grease in the sauce and crisp bacon mixed in with the potatoes makes this such a tasty side dish that it is always gone when I bring it to a pot luck in Alabama. I grew up in Wisconsin where German Potato salad was home cooking! I would think you could since both potatoes are “waxy” and are great for roasting, mashing, and salads. I am from Georgia, and all I ever heard was stove eyes. I am going to make that German Potato Salad! It looks so good in the picture. I want to comment on the cassrole dish the salad is in. It’s called Blue Heaven and was made by Royal China. My heart skipped a beat when I saw yours. My mom (who just passed away in February)had a complete set in the 60’s but she used it so much several of the pieces were broken or came up missing through the years. I am currently trying to replace as many as possible. It’s always a pleasure to receive your emails. I’m fairly new to your site and wanted to just say I LOVE IT!! I discovered your site while searching for southern pinto bean recipes and stopped searching when I found yours. I made your version and got hooked imediately. It was very close to my moms, god rest her soul, which being poor growing, she made 2 or 3 times a week for our supper. Yours was sooo good that after I finnished licking the bowl, I came back to your site and bookmarked it. And, I did something I never did before on a recipe site, I signed up! I am of polish(mom) and southern heritage (polebilly)…lol, so I have experienced some very unusual and delicious foods and know what I’m talking about when I tell you that your recipes are keeping it real. I truely love your humorous family stories, they make me smile and sometimes laughout loud. And your insperational quotes make me pause and give thanks. Please keep your great recipes and stories coming I truely enjoy them. Heres hoping you and your family a blessed and happy day, sincerely, Ken. Welcome to Southern Plate Ken!!! I am so glad you found me. Thank you for trying my pinto beans and I hope you find many other recipes to try…so grab a glass of sweet tea and join us at the table. We are all looking forward to getting to know you and having you as a part of the “family”. I love it too Nancy!!! I love German potato salad and was wondering if you could substitute Splenda for the sugar? Absolutely! I’d add a little less than you think you need as Splenda sweetens it slightly more than sugar. Happy Easter Christy, was thinking of making mash potatos on Sunday. I will be making this salad, my husband loves red skin potato salad. He has German heritage in his family. Thanks for this great recipe.I always read all of your post.God bless. Happy Easter to you and your family Liz!!! I hope you enjoy the potato salad!! We had a similar recipe growing up but our salad always had celery seed. It was an unusual flavor but added something special. I will have to try that Brenda, thanks for sharing your way!! Loved the recipe but the dish it’s in caught my eye. It’s Blue Heaven by Royal China. Mom (who passed away in February) had the complete set in the 60’s but over time several pieces “disappeared”. I am trying to pick up the missing pieces as time goes by but it was a nice surprise to see the potato salad in the Blue Heaven. Thank you for using it. Beautiful casserole dish. This recipe sounds wonderful. I grew up in Pennsylvania Dutch country (actually German heritage – “Deutsche “) and our German potato salad always included chopped hard boiled eggs. I was surprised no one else mentioned this. That’s how my Mom always made it also…I could kick myself, that I never paid enough attention, when she was making this particular dish, especially the dressing! A little of this, a little of that…..she and my Grandmother were wonderful cooks, nothing like home-cooked meals, to bring back great memories and happiness. Yes we are German and I never had potato salad without hard boiled eggs. My Dad hates mayo so we never knew any other potato salad till we were much older. I hope you have a Happy Easter too Judi!!! Sounds delish! Will have to try it when it’s just me and the hubby. Don’t want to spring something new on the rest of the clan at our gathering Easter Sunday. They are all pretty picky about my plain tater salad with mayo and a couple drops of mustard and a heaping spoon of sour cream. Just wanted to tell you I love getting your recipes and love your stories. I make this potato salad all the time. I make quadruple the amount and freeze it. I have friends who like it too, but don’t make it. So occasionally I give them some to add to their potatoes. It’s also nice to have sauce made already when company comes. That is a great idea Sharon!!! Thanks for sharing!! I for sure will try it for EASTER, sound delicious. thanks. Good nite from Texas!!!!!!. I hope you enjoy it Agnes!! I’ve never tried German Potatoe Salad, so use to making the mayo/sour cream,hard boiled eggs Potatoe Salad, but it looks good, so i will have to give it a try. Happy Easter, Thanks Christy. Happy Easter to you and your family Annette!!! I hope you enjoy the potato salad! 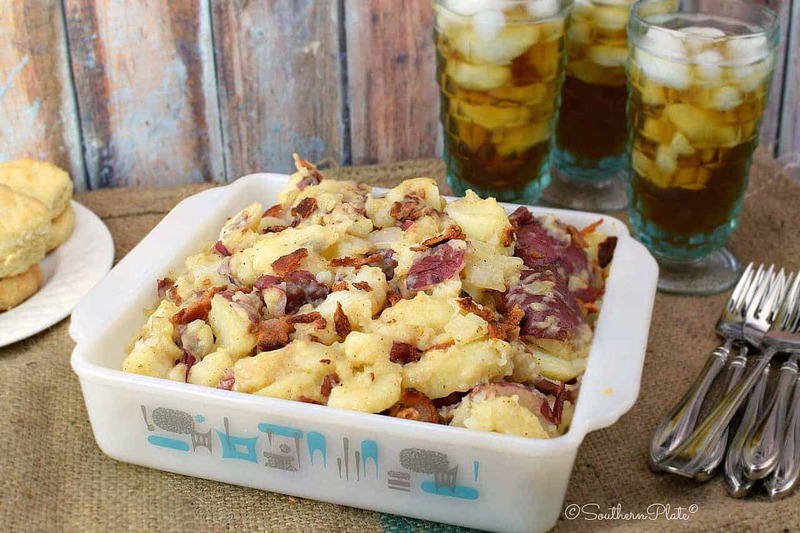 Make this for Easter with my Ham and corn casserole. I love it and it was easier to make than what I thought. I think I will cut back on the sugar, as I don’t enjoy sweet in my starches. I am so glad you liked it Novella!! 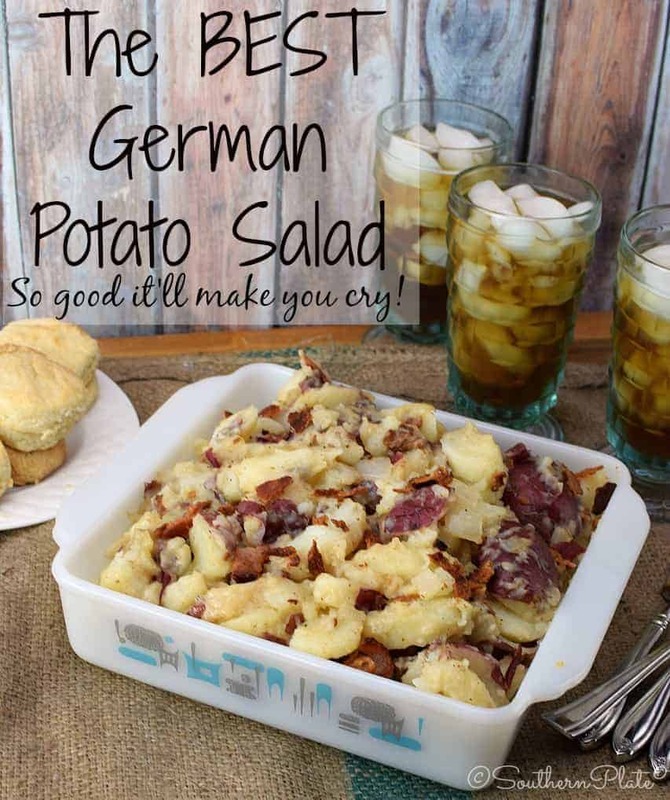 This recipe looks SO good, I love german tater salad. Also, a little brag on your banana pudding recipe. It’s the same as my mama’s was and all my kids and grandkids love it. I made it for Easter dinner for my bunch, as usual. One of my son in loves is children’s pastor at our church, and he is a long tall drink of water. His wife (my youngest daughter) cooks very healthy and kind of watches what they eat. John got into the banana pudding and kept making a bigger and bigger pile on his plate. Sister said, “John, is that all for you?” He looke up, said “yep!” and kept on spooning! He ate every bit too. I don’t have a lot of tolerance for guys who eat every stinking thing that tastes good. Tell him he can make it for everyone next week. Yeah, it is good. What did you do to achieve that? Does he wash the dishes? I am sick of guys who lard in, feed their faces and do nothing to help in a huge endeavor. Otherwise, I follow your recipe religiously. Christy, I slice my onions thin and leave them raw. I also chop celery up fine . I add the celery to the bacon drippings. 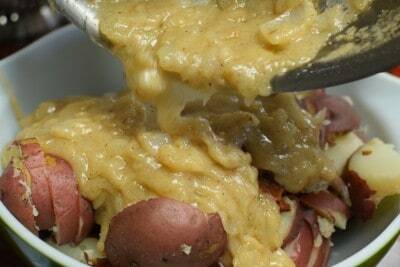 I then slice potatoes, add sliced onions, bacon and celery, pour dressings over this. Hot dressing softens the onions. I also add caraway seed to the salad. Love your recipes, but love your sharing your family with us. Your version sounds good too Bonnie!!! Made your German Potato Salad this week and it truly is delicious. Wanted to wait to comment until I had actually tried it. So many comment having not tried a recipe and to me that means nothing. I do enjoy your site and the recipes I have tried. I’m so glad you liked it!! Thank you for taking the time to let me know. 1. If you mean, do I know that it happened, yes. If you mean, do I have any meomry of it well, I was born in 1973. So, no.2. I don’t know. There’s a shade of blue that appears right about as the sunset is fading into dusk which I think might be my favorite color, if I’m really pressed. It’s pretty much a question of context, though.As for a least favorite, I think I’d have to go with whatever one would call that shade of greenish black I encounter when changing Zach’s nastier diapers.3. Probably. We’re not buying much, and I think we’ve finished buying, but there might be something still to come. My wife is making most of our presents this year and I’ve done a few.Ken Leonard recently posted..